Kampuchea-Krom literally means “the lower land of Kampuchea.” “Krom” in Khmer also means “below” to indicate “Southern” part of Cambodia. Kampuchea-Krom was the southernmost territory of the Khmer Empire, and was once known as Cochinchina (French). It covers an area of 67,700 km2 with Cambodia to the North, the Gulf of Thailand to the West, the South China Sea to the South and the Champa’s territory to the Northeast. Today, Kampuchea-Krom is the south-western part of Vietnam, known in Vietnamese as Tây Nam Bộ. The Vietnamese authorities changed all the locality names of villages, districts, cities, and provinces from Khmer to Vietnamese. The same thing is being done today in Cambodia. For example, “Phnom Penh” is called “Nam Vang” by the Vietnamese. 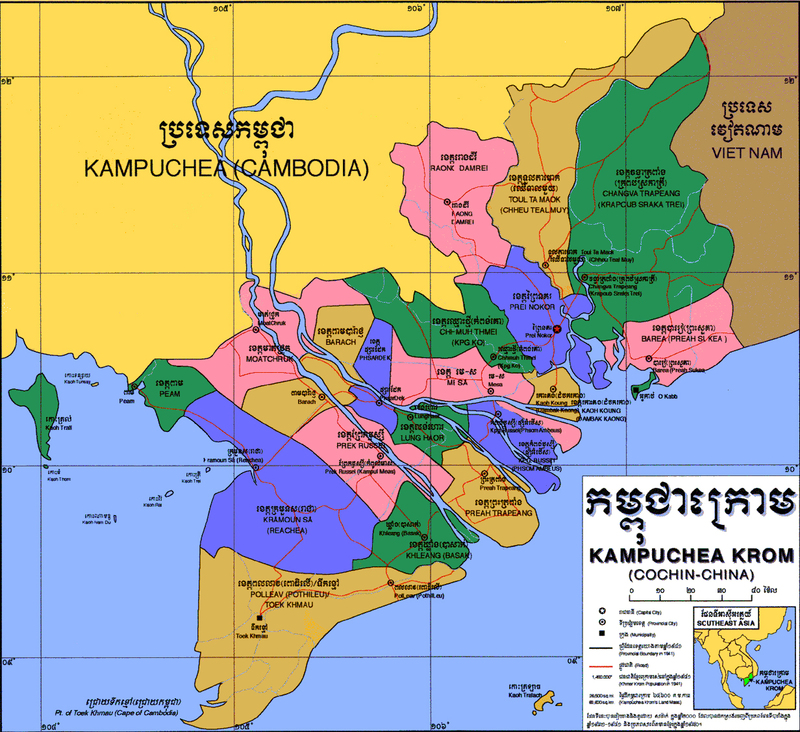 Kampuchea-Krom originally consists of four provinces DO NAI, LONG HOR, MOTH CHROUK and PEAM, later on divided into 21 provinces and 1 Port: Kompong Krobey (Bến Nghé). Kampuchea-Krom also has two big islands: Koh Trol (Phú Quốc) and Koh Trolach (Côn Sơn). There are two long rivers in Kampuchea-Krom: the Mekong river (Sông Tiền) and Bassac river (Sông Hậu). The approximately length of each river ranges from 200-250 km. These two rivers bring lots of silts for the Mekong Delta.